SecurityPlus for MDaemon 4.1.2 free download. 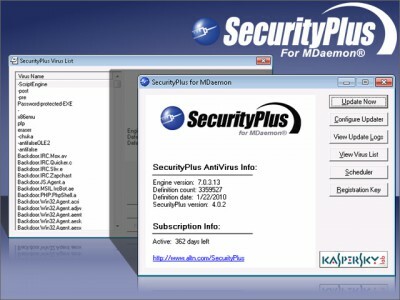 MDaemon AntiVirus (SecurityPlus) protects your network from email viruses, worms and trojans. Based on the reliable Kaspersky virus scanning engine, MDaemon AntiVirus helps to ensure that your email arrives free from viruses. Because it is integrated with MDaemon on the server instead of residing on your users' personal computers, viruses are stopped before ever reaching individual users on the network. Inline Antivirus Scanning: Scans messages inline during each SMTP session effectively stopping malicious software at the email entrance to your network. Kaspersky Antivirus Engine: Combines traditional antivirus defense methods with the latest proactive technologies to provide solid and dependable protection against viruses and malware. Urgent Update Notification: Upon notification from Kaspersky Labs, provides a trigger to automatically initiate a database update of the latest virus definitions, keeping your business safe from new and emerging threats. Zero Hour Virus Outbreak Protection: Real-time, anti-spam, zero-hour anti-virus, anti-spyware, and anti-phishing technology capable of proactively protecting the MDaemon Pro 9.5 or later email server automatically and within minutes of an outbreak. Alt-N SecurityPlus for MDaemon is the best solution for safeguarding your MDaemon email server. Purchase of MDaemon AntiVirus includes one year of free upgrade protection and virus signature updates. AntiVirus can detect infected attachments in both plain text and HTML messages. When an infected attachment is detected, you can attempt to clean it, it can be quarantined or deleted, or you can do nothing and allow MDaemon�s Content Filter to handle it. Additionally, you can designate specific domains and addresses to be excluded from scanning. Schedule automatic upgrades and automatic updates of virus signatures and definitions. AntiVirus for MDaemon automatically downloads and installs updates for hands-free administration. Provides links to Internet sites with virus information and updates. You can notify the sender, recipient, and postmaster when a virus is detected. AntiVirus for MDaemon includes an administrative log that keeps track of the type, time, and location of detected viruses.